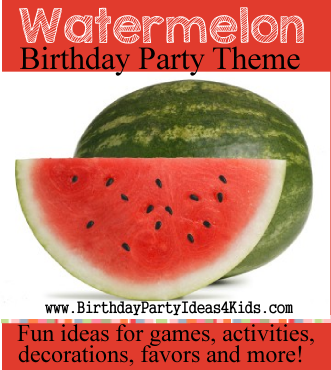 Watermelon themed birthday party ideas. A Watermelon party is great for summer birthdays! Glue a wide piece of green and white striped ribbon to the top of pink note cards for a fun and easy watermelon invitation. Glue pink patterned scrapbook paper over 1/2 of a note card - and green patterned scrapbook paper over the other half. In the center, where the papers come together, glue a piece of black and white polka dotted ribbon. Green and pink party supplies in any pattern. Green and white checkered tablecloth with hot pink plates, cups and flatware. Wrap pink flatware in green napkins and tie with a black polka dot ribbon. Or decorate party area in a traditional picnic theme with red and white checkered tablecloths, picnic baskets, fresh flowers and blankets on the ground for guests to picnic on. Draw seeds onto pink or red balloons with a permanent black marker - mix with green balloons. Make funky flip flops for the guests to wear during the party. Buy green and pink material and tie on to flip flops. Complete directions for our flip flop craft. Set up traditional picnic style games for the guests to play such as a three legged race or tug of war. Cut out teardrop shapes from poster board for the watermelon seeds. On a few watermelon seeds write down a number - this number will correspond with small gifts or candy. Hide the seeds and ask guests to find all of them. When the watermelon seeds have all been found the kids can turn in the seeds for small gifts or prizes. Cut slices of watermelon in equal sizes and place on paper plates. The guests then place their hands behind their back and on "go" start to eat their watermelon slice as quickly as possible. The first guest to finish wins a small prize. 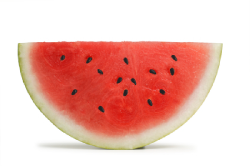 Divide party guests into two teams and each team gets a large watermelon. The object of the game is for the teams to roll their watermelon across the playing area to a set mark and then back.. First team with all of their members to complete the relay wins. Variation: After kids master rolling the melon with their hands have them roll it with their noses or without hands. For more fun games see our party games page and our pool party games page. Watermelon and fruit kabobs - cut thin slices of watermelon and other fruits with a round or flower shaped cookie cutter and place alternating fruit slices on skewers.